This issue of Roleplayer leads off with David Pulver's Ultra-Tech designer article, including examples of new weapons. Also in this issue are designer articles on The Prisoner and Cyberpunk, an article about how to design a Super and information about new and upcoming products. 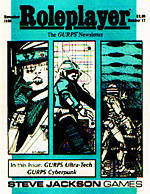 Roleplayer is published bimonthly by Steve Jackson Games Incorporated, Box 18957, Austin, TX 78760. Roleplayer, AADA, GURPS and Autoduel are registered trademarks of Steve Jackson Games. Other product names mentioned herein are trademarks of Steve Jackson Games or their respective publishers. Copyright © 1989 Steve Jackson Games Incorporated. All rights reserved. Printed in the U.S.A.